GAIA Europe Collection with "Lion" embroidery on center front. With a Flexfit® Mesh Cap you are always well dressed, apart from the super practical sun protection! Additionally it has a suitable style for everyone. For best comfort and perfect fitting it has the Flexfit® closed back. Mesh on the back of the Cap provides pleasant cooling on hot days. 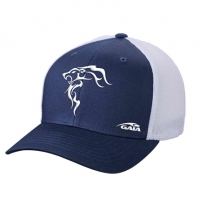 NOTE: The GAIA Flexfit® Caps are available in two sizes, please select your size below. This Product was added to our catalogue on Tuesday, 25. September 2018.